← World Horror in New Orleans! We stepped out of the van into the heat. The air was alive with the songs of insects: cicadas, grasshoppers, flies whining through the air. We covered our exposed flesh with bug spray as a woman hustled off the trail. “The yellow flies are biting,” she said, rushing into her car. I was amazed that a woman would walk alone in a swamp — but she wasn’t the last that we saw. My daughter stopped along the trail to look at every bug. She found fuzzy black caterpillars, orange ones, even a pale blond one. Stoo warned her not to touch anything. In the swamp, even the caterpillars bite. She found a tiny frog with yellow racing stripes. He was still there later, when we returned along the path, so she nudged him with a leaf. His leap was a thing of beauty, an effortless arc that carried him away into the poison ivy. 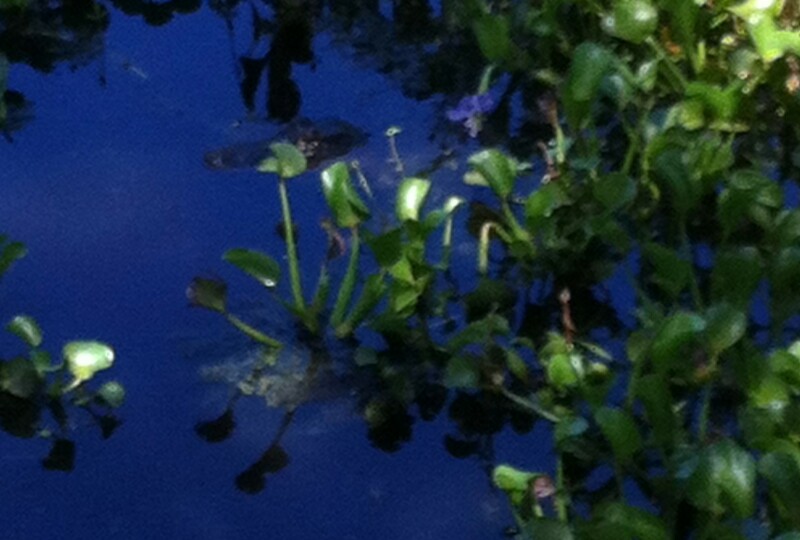 The first alligator we saw might have been a log with eyes floating in a pool of shadow. I didn’t bother to photograph it, since I wasn’t sure I’d be able to see it later. 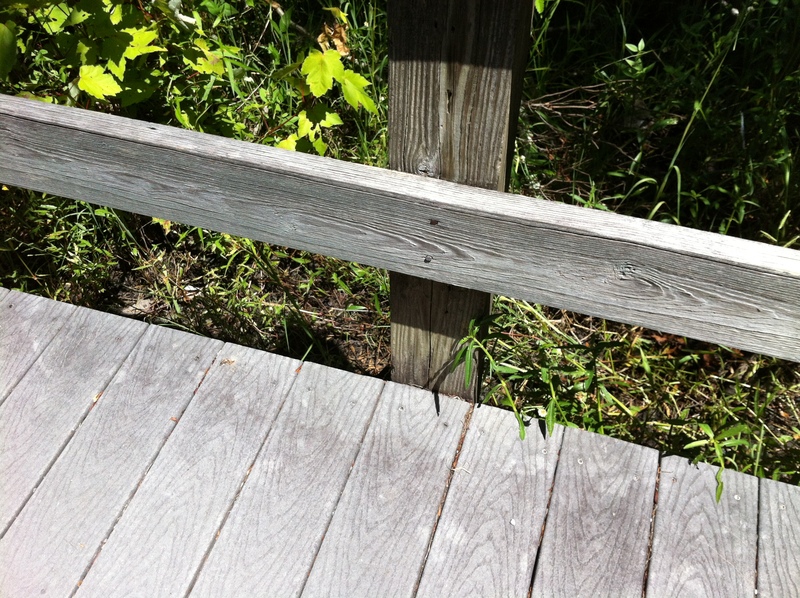 Later I saw a trail of grass mashed down as something very large and low to the ground dragged itself under the boardwalk. Stoo warned us not to stray, that things lived under the boards during the heat of the day. Once we began to study the few open pools of water, we found other alligators watching us. When Stoo was in high school, he used to ride his bike to the Algier ferry, then ride along the levees to the swamp, where he’d rent a canoe. I was nervous enough just walking through the swamp; I couldn’t imagine riding through it in a boat, on a level with the gators and cottonmouths and leeches. We passed a group of little kids — ages five to seven — on a field trip from camp. The chaperone said that one of the gators had come right out of the water at them. It was enough for me that they watched us. 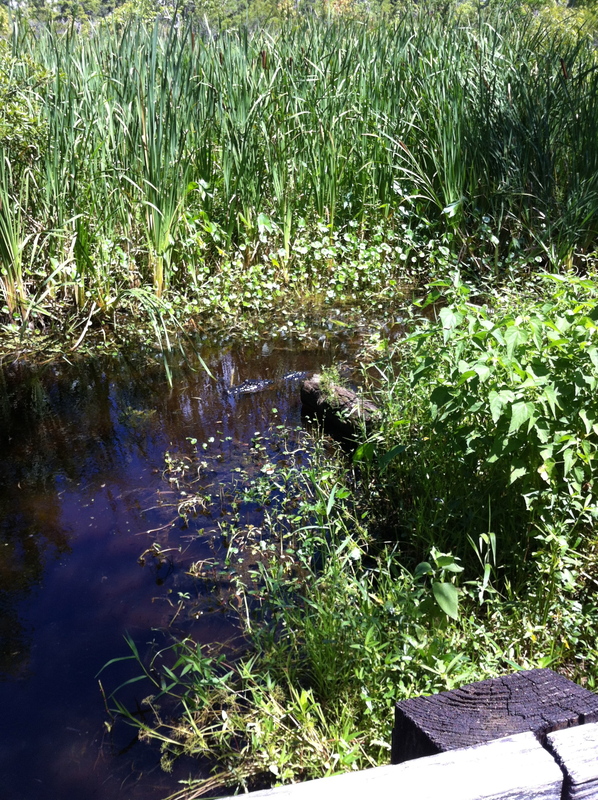 My daughter sat on the steps over the water, communing with one of the gators. She wanted to see him come up on the bank below her. For his part, he seemed content to watch her, in case she dropped something good to eat. We returned along the same path, checking in with the same gators. We saw some swimming, but none basking on the shores. None, anyway, that we couldn’t be sure weren’t actually logs. Then we reached the pool where a gator named Smiley lived. Smiley was born with a misaligned jaw. She couldn’t really snap her jaws closed, which prevents her from eating big prey. Instead, she strained minnows from her pool. Stoo said she was much smaller than she should be for her age, because she couldn’t really feed herself. 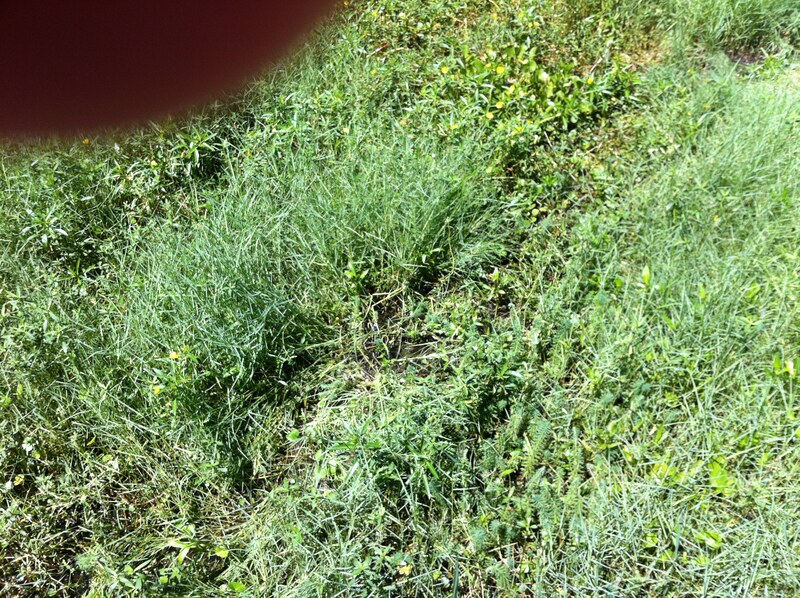 After we passed Smiley’s pool, something large crashed through the brush behind us. Stoo and my daughter went racing back, hoping to see a deer or a nutria. Instead, Smiley had rushed out of the water after us. I couldn’t get my camera up in time to capture her because I was busy shouting for my daughter to move back. The alligator stood two feet away from her, mouth full of snaggle teeth. 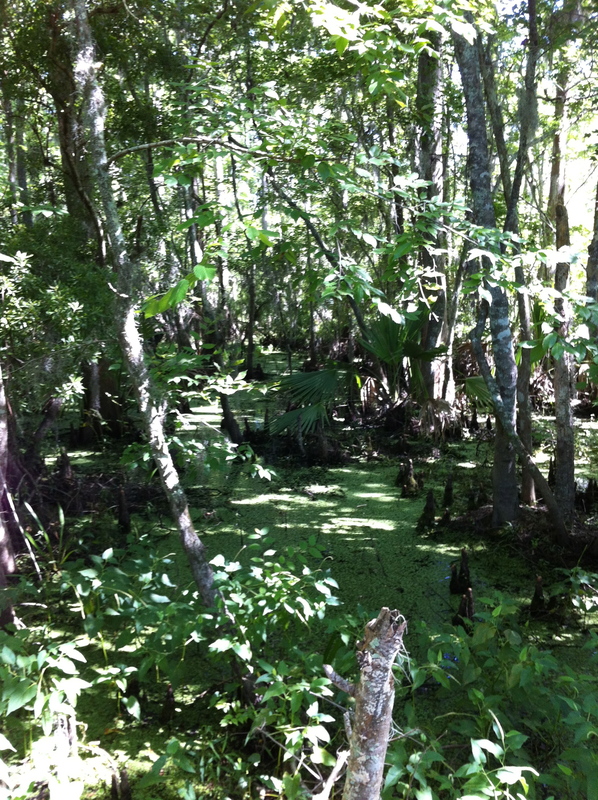 I am thrilled that we got to walk in the swamp, that we were blessed to have seen so much wildlife. Even though we didn’t see the monster alligator who dragged himself through the grass, we saw plenty of the beasts going about their daily lives, chasing turtles and fish. We saw cardinals and finches flitting through the trees. Black or orange butterflies danced on the breezes, echoed by dragonflies in shades of fire and grass. I got bitten by flies, big, stinging bites that swelled and burned. Sweat slicked my throat. Sun burned my arms. I got a sense of how Jean Lafitte and his pirates used to live — and I realized that I never, ever wanted to spend the night walking in the swamp. I’m glad this treasure exists. I’m startled that people treat it so casually that they walk alone there or take little kids there. I’m sad that someone has been feeding Smiley, so that she’s losing her fear of humans. That can only end badly. And I’m grateful to Stoo for showing us this wonder. This entry was posted in Travel adventure and tagged jean lafitte, New Orleans, wildlife. Bookmark the permalink.